Light: Honoring limits. Respecting the rules. Deciding to go on a diet for your health’s sake. Recognizing you cannot always be in control. Identifying obstacles to further progress. Refusing to think about unhealthy or unethical options. Asking for assistance. Shadow: Feeling trapped. Being lost in a maze of rules and regulations. Giving in to despair. Playing the victim. Allowing others to dictate what you can and cannot do. Being rendered helpless. Having very few options. Failing to look for a way out. Story: The Main Character must call on his or her ingenuity to escape a trap. Relationships. Feeling boxed in? You have exactly as many options as you imagine you do. There is a way out, but someone is refusing to see it. A relationship should broaden horizons, not limit them. If the rules are uncomfortable, perhaps it’s time to re-examine them. Work. Some restrictions are necessary; others are merely tradition. Ethics demand you play by the rules; sacred cows, however, are fair game. What are the obstacles, exactly? If your limits didn’t exist, how might you move forward? Thinking freely will open unexpected options. Spirituality. The free spirit cannot be contained by the physical constraints. As you learn to cultivate balance and focus, you may find that most obstacles are self-imposed and most limits are strictly imaginary. When you focus your will, blindfolds and bonds will fall away. Personal Growth. Knowing your own limits is important; respect them. Whatever the issue, you’re balking for a reason. There’s no harm in refusing to move forward for now, and no shame in saying, “No.” A mature person communicates what he or she needs with absolute confidence. Fortune Telling. Get over playing the victim. Once you realize you are your own biggest obstacle, nothing can hold you back. When? Between May 21st and 31st. The Blade Barrier. 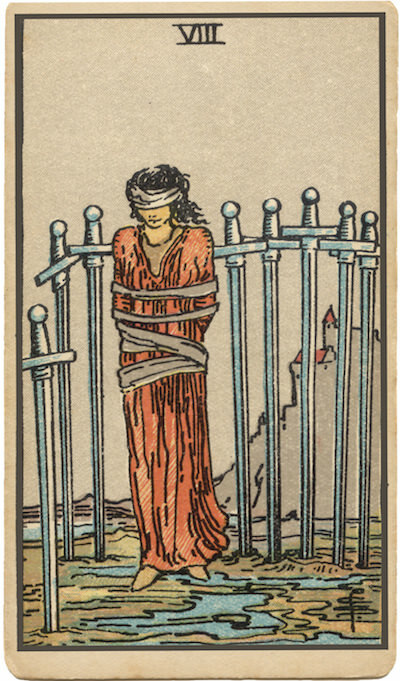 RWS-inspired versions of this card depict a woman trapped in the middle of a circle of swords. Many have noted the circle is incomplete; escape is simply a matter of casting off the blindfold and taking that first step. How many of your own limitations are strictly imagined? The Loose Bonds. Many versions of this card feature someone tied with what appear to be very loose bonds. (Compare the chains around the fawns’ necks on Trump XIII.) In your own situation, have you abandoned all hope of escape too soon? Might just a bit more struggle cause your bonds to drop away? Drop the Blindfold. Take a look around. Has the Universe been showing you an escape route you’ve been too proud or too distracted to see? What might happen if, instead of moving obediently from A to B, you rudely jumped over the walls? The Marseilles Image. Eight sharp, curved blades interlock in a double knot of steel. A single blossom, all but crushed, remains, along with four unopened buds. Even when options are severely limited, the potential for growth remains. Who’s empowered to cut through the red tape? What, exactly, are the obstacles? What resources, exactly, are needed to move them? To what extent is your powerlessness a matter of attitude?